I love seafood. Aside from crabs and shrimps, scallops and oysters are in the top of my favorite food list. It's not easy to find fresh oysters when I buy my produce and groceries so I indulge from time to time when we dine at restaurants serving them. Medyo mahal lang. I still remember the baked oysters in 5 ways that we always order from Via Mare fine dining when I was still working in Tektite Towers. I dated myself again... I know, that was eons ago! But those were memorable times, and dining there were saved for special occasions or when treating an advertiser-client. I haven't had bake oysters in a long time. These days, I'd be lucky if I find fresh oysters in the market. Usually, I find freshly packed shucked oysters at SM Pasig Hypermarket and buy a pack to cook at home. When I'm lazy, I just saute the oysters in garlic and ginger with oyster sauce or teriyaki sauce, which I featured here. Sometimes, pag feel ko lang, I split the pack and serve two ways -- yung half ginagawa kong kilawin na talaba, and the rest are sautéd in oyster sauce. 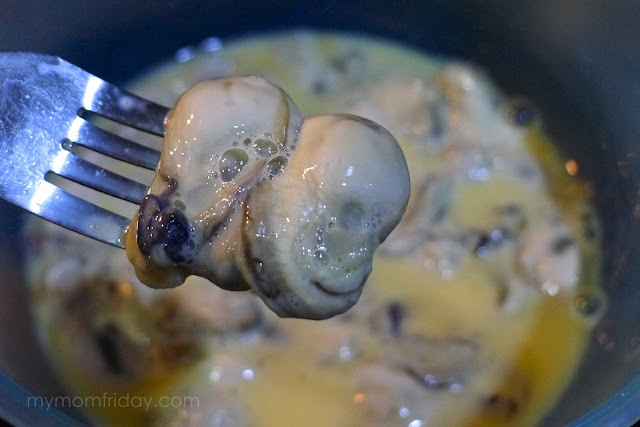 I've been wanting to try to fry oysters, but I get too lazy to dip and dredge and over cook the oysters. I'm scared na masayang yung oysters pag palpak ang luto. This time, I went for it and thank goodness, it was a success! Pat dry the oysters after you drain out the liquid. 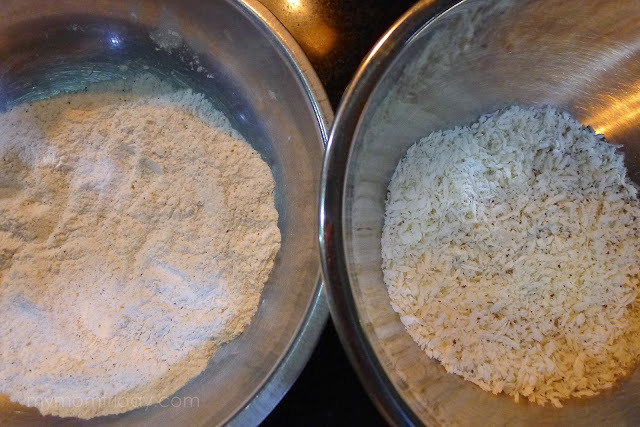 Add all the powdered seasonings to the flour and mix. Use a fork or tongs -- Dip oysters in egg piece by piece, then dredge with flour, then back to the egg, then coat with panko. Press down in the panko to help crumbs stick to the oyster. Be sure the oysters are breaded well. Check oil if almost smoking. Drop the breaded oysters one at a time. Deep fry for about 2 minutes, or until golden brown. Do not crowd your pan. Flip as needed for even cooking. Scoop and drain on paper towels. Serve immediately with your preferred dipping sauce. Some would like spiced vinegar, hot sauce, or seasoned mayonnaise. For this particular meal, I just used Sriracha sauce. 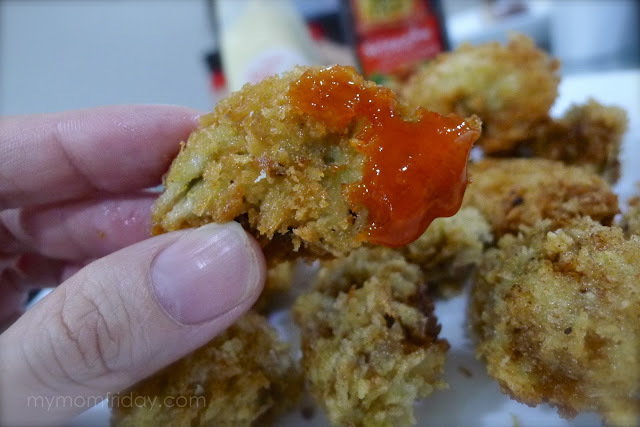 For a milder and creamier version, I mixed Sriracha and sandwich spread (pickled mayonnaise) which went perfectly with the crispy fried oysters. Panalo!